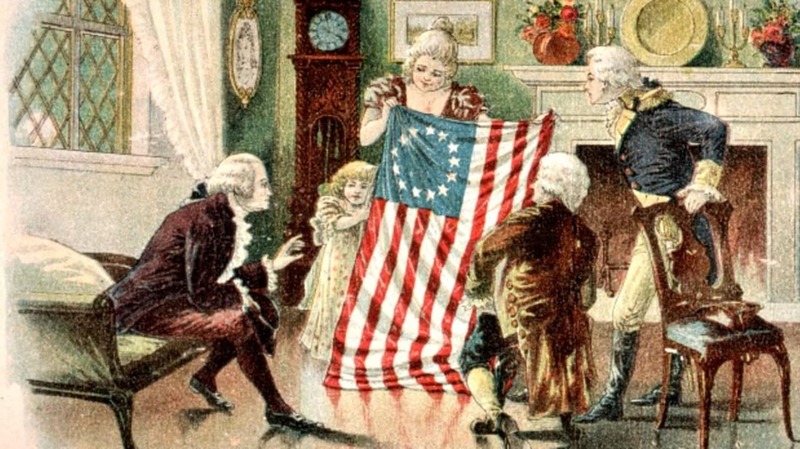 The Betsy Ross story we all grew up with didn’t even come to light until about 100 years after the fact, when Ross’ grandson, William Canby, presented the Historical Society of Pennsylvania with a research paper that said his grandmother had sewn the flag. The problem with the research paper, other than it being 100 years belated, was that it presented no hard evidence. The only thing Canby had to support his claims were affidavits from family members. The traditional Ross tale goes something like this: Ross was manning her sewing shop one day when her late husband’s uncle, a Congressman from Pennsylvania, entered her shop. He was accompanied by Commander-in-Chief George Washington. They said they represented a committee of Congress that had been tasked with creating a new flag, and asked if Ross would be up to the task. Though she had never made a flag before, Ross agreed, and even went on to work with Washington personally in the back parlor of her home. Together, they reviewed designs and she suggested modifications, such as switching the stars to have five points instead of six. It’s a great story, one that has endured for more than 150 years now. But historians doubt its accuracy. First of all, if there had been a congressional flag committee—and there’s no evidence there was—Washington wouldn’t have been part of it, since he wasn’t a member of Congress. Second, the first record Congress has of addressing the flag issue at all doesn’t appear until 1777. And finally, there’s absolutely zero documentation showing that Washington had any interaction with Betsy Ross at all—and we’re talking about a man who kept meticulous financial records. All that being said, we don’t actually have anything that disproves that Ross made the flag. She did make flags during that time period—but were several other seamstresses in Philadelphia, including Rebecca Flower Young, who also made the Grand Union flag. Unfortunately, unless a long-lost receipt or diary is uncovered in someone's attic, we'll probably never know for sure how involved Ross actually was in sewing the first American flag.